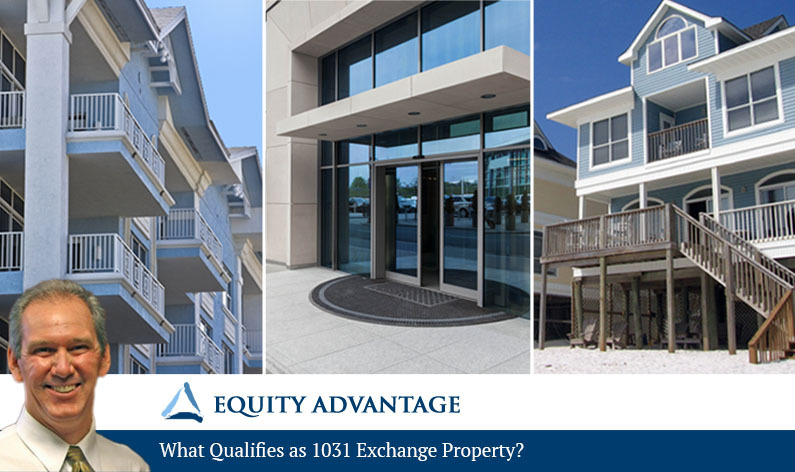 One of the most common questions about 1031 exchange property is: what qualifies? In this episode of our popular blogcast series, David explains the like kind rule, which governs what does and does not qualify. Patrick: Today we’re talking with David Moore, co-founder of Equity Advantage, a firm that specializes in tax deferred investments, in particular IRS section 1031 exchanges. David, what qualifies as 1031 exchange property? David Moore: Well, it’s actually any property that sells for productive use in trade, business or for investment. Typically people look at real estate and they think, well, that’s what’s got to fit. Really, what qualifies is directly dependent upon what is like kind for a given asset. So, when we apply it to real property it could be any real property held for investments like kind of with any real property you tend to hold for investment so you could exchange from dirt into apartments and office buildings, place at the beach to retire into at some point. When we apply the like kind requirement to a business, we start having to break it down in different components of the business and blue sky and goodwill don’t qualify at all. We start looking at the assets of the business, things that are in inventory, they would not qualify. If we’re looking at aircraft, pretty much aircraft are aircraft. Cars are cars, art is art, but the like kind definition definitely tightens dramatically when we’re looking at personal property exchanges versus real property exchanges. Sort of along those lines, 1031 has experienced some issues with proposals on tax reform and over the years people have looked at 1031 as an instrument for the wealthy, where the bulk of our deals are real estate transactions with people taking small properties and making them bigger over time. A lot of these people are people that wouldn’t normally have the money to engage their own legal people to go through a whole bunch of estate planning. It’s a great tool for the every day guy. There have been proposals that would eliminate the exchange of collectibles, so art and cars, things like that are probably things that would be more upper class engagement in those activities. The way it is today, it really just depends on what type of asset we’re looking at, what is going to qualify and what is going to be of like kind. If we’re talking about real estate, once again, it’s just got to be something that’s been held for investment and something you’re going to acquire that’s with the intent to hold for investment. David, when do people need to get you involved? David Moore: Great question and one that I wish people would ask more often. We’ve had a couple calls today with people trying to engage us after a property is closed. If a tax payer has actual or constructive receipt of the funds, the ability to touch the money even if the deal closed, the money is sitting in escrow, it’s never been picked up, it’s too late. That taxpayer has the ability to get it. We need to be involved. You’ve got to structure the exchange prior to settlement. If it’s closed, it’s too late. Earlier, better and when people ask us when we’d like to be involved, we often tell them we’d like to be involved when they decide to put the property on the market. That way we can help troubleshoot the transaction at deal inception instead of trying to clean up a mess after the fact. Patrick: Thank you, David. Listeners may call 503-635-1031 or can visit 1031Exchange.com for more information. You have to be sure to follow the rules on 1031 exchanges, or you can expose yourself to significant tax liability. Put experts on your team by calling David or a member of his team of professionals today!